Home›Money›Good Profit. Have a Thriving Business And Still Be Nice. Charles Koch's Success. Good Profit. Have a Thriving Business And Still Be Nice. Charles Koch's Success. Over the past few years, there seems to have been an increased entrepreneurial focus that's just about MONEY, GREED and OVERALL NASTINESS. Of course everyone is not like this, many executives have a heart and want to do good. However the image portrayed in much of the main stream media is a "dog eat dog" world. It's raise VC money and screw your investors or your employees. Wealth does NOT have to be created this way. Profitable businesses don't have to be created this way. 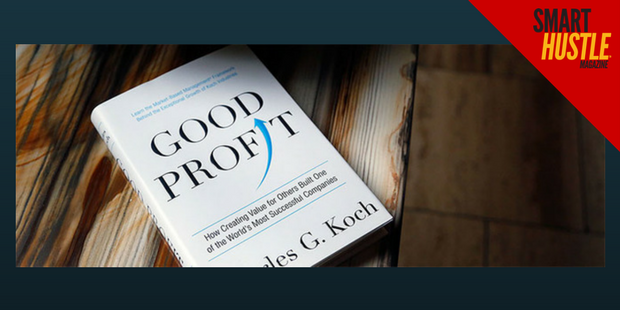 In "Good Profit" by Charles Koch, we learn the timeless principles of Principled Entrepreneurship. Charles writes that this is all about "creating superior value for our customers while consuming fewer resources and always acting lawfully and with integrity". See my video review below and read the rest of my review below the video. Travis Kalanick, founder of Uber, is one of a long line of "poster boys" who are smart and can create amazing companies. However they and the culture they foster are diseased. "Good Profit" is about how to build great companies that have amazing profit and create wealth, but NOT at the expense of customers or employees. Another key principle of "Good Profit" is Market Based Management. It's a principle that emphasizes Principled Entrepreneurship over corporate welfare, virtue over talent, challenge over hierarchy, comparative advantage over job title, challenge over hierarchy, comparative advantage over job title and rewards for long-term value creation over managing to budgets. If you're a leader who knows you need to improve, read "Good Profit". If you're thinking of starting a company or an employee of a company you care about, read this book and share it with others.